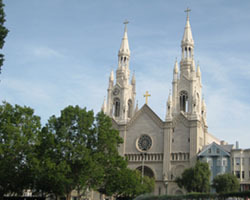 Washington Square Park is a beautiful park located in the heart of San Francisco’s very own North beach. The park is host to many activities such as art shows festivals and parties. There are also landmarks close to it, such as Coit tower and the fire fighters’ statue. There is also a playground where little kids can play. The park is also close to many restaurants so grown ups don’t have to worry about food. The park has had many good reviews by countless tourists. Washington Square Park is also a good place to bring your pets; a lot of people like to bring their dogs to play catch. While you’re there pay a visit to the famous north beach restaurant, or if wine tasting is more your thing you can go to coit liquors. Also, don’t forget to visit the historic Coit Tower, take a few pictures and have a good time. 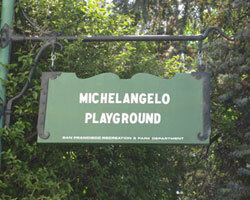 Michelangelo Park was recently made during the 1980’s. It contains a basketball court, a tennis court, a wooden balcony with a table, a playground, and a beautiful garden. It also has a couple of benches. Even though that may sound like a mouthful, the park isn’t very big. From the wooden balcony, you can see most of the park. Facing north, you can see the basketball court and the tennis court. Facing to the left of that, you can see the playground and garden. If you just step outside the park, you can see part of the bay. It is quite a sight from here. The park can be recognized from the outside by tons of leaves surrounding the outside of the park. The playground has a belt bridge, and a couple of slides. The playground connects to the balcony, which is a useful and innovative design. The park is located away from busy streets, so the area is quite. You can sit in the shade and just relax, or you can go to the balcony and have a lunch. There is plenty of fresh air here, especially being surrounded with plants. I strongly suggest visiting this park if you feel stressed. This park is definitely worth a visit. "The park is a host to many activities such as art shows, festivals and parties."